Thalassinideans are shrimp-like decapods closely related to the Anomura and Brachyura. They typically have at least one pair of enlarged chelipeds, small eyes, a much-reduced first abdominal segment, but long abdomen, and tailfan. The carapace and abdominal exoskeleton of thalassinideans is usually thin, translucent and somewhat soft, so not surprisingly, they rarely leave their burrows. 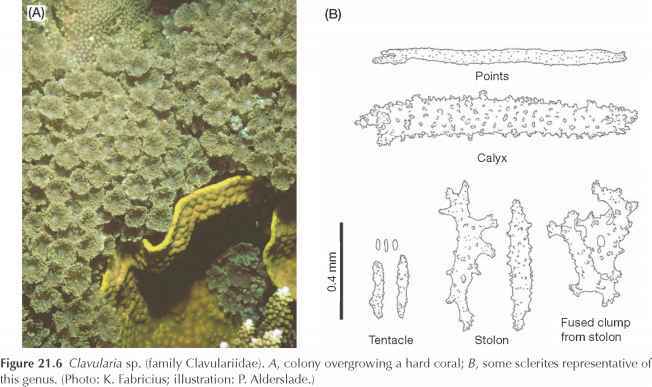 Most thalassinideans burrow in sand and mud, but some burrow into sponges, live in holes or under coral rocks. Those burrowing in soft sediments, especially of species of the Callianassidae and Upogebiidae, are important bioturbators, often creating tall mounds of excavated sand and mud around the burrow entrances. The species most likely to be seen on the reef flat is the orange Strahlaxius plec-torhynchus, living in vertical, rubble lined burrows on the inner reef flat. Strahlaxius glyptocercus (Fig. 23.3E) and Trypaea australiensis (Fig. 23.3F) occur in muddier or more fine-grained habitats, especially closer to the mainland coast. At least 38 species in nine families are known from the GBR. Thalassinids are usually difficult to capture because of their deep burrows, and no doubt many more species than presently recorded occur in the region.